‘The Knitter’, Issue 100, is out now and in the shops. To celebrate the 200th anniversary of Charlotte Bronte’s birth, this year, I’ve contributed an article about a fascinating and previously unknown piece of knitting; a pair of baby socks, made for Charlotte’s baby, which were destined never to be worn. They were found sewn into a book of Charlotte Bronte’s correspondence with Mrs Elizabeth Smith, mother of her publisher and friend, George Smith. So far as I’m aware, ‘The Knitter’ is the first publication ever to publish a photo of these poignant items. Charlotte was pregnant when she died in 1855 of hyperemesis gravidarum. I had that with one of my pregnancies – for 20 weeks; all day, every day. It is not the way anyone deserves to die. Charlotte was already weakened, and possibly had incipient TB. Her friends had expected her to rally – more than one, was busy making baby items. Miss Margaret Wooler, Charlotte’s old teacher, colleague and friend, made an exquisite (not knitted) baby bonnet. These are possibly amongst the most poignant items in the entire Bronte Society Collection. I won’t reprise the piece here (buy ‘The Knitter’, gentle Reader!) But I will give you something we couldn’t fit into the article as a bonus for my brilliant blog readers – some of whom I met at Baa Ram Ewe’s season launch, last week. More of that in an upcoming post. A caveat. This isn’t a true reverse engineered version. I am not a sock knitter – apart from the occasional recreation of a stocking for Living History. There are things going on in this sock – the toe treatment for one – that I can’t pin down. So I looked at a contemporary published sock pattern, and I looked at the notes I took from looking at the sock in person. I ended up knitting a version of ‘Child’s Sock’ from Cornelia Mee and Miss Austin’s ‘First Series of The Knitter’s Companion’, available here in a very late edition. Cornelia Mee (1815 – 1875) wrote a number of successful knitting manuals from around the 1840s onwards and often reprised her recipes for children’s socks, so this appears in one form or another, across more than one of her books. In the 1841 Census, Cornelia, 25, was married to Charles Mee, ‘Berlin Wool Warehouseman’, and a teenaged Miss Mary Austin appears to have lived with them, working as their “shopwoman”, on Milsom St, in fashionable Bath. Like Jane Gaugain and Elizabeth Jackson; a wool shop owner, publishing her own books. Mary Austin was no doubt her co-author, “Miss Austin”. In 1851, she was mistranscribed as “Amelia” Mee, and now at 18, Daniel St, Bath. The 1851 Census is the first to give birthplaces, and so we learn Cornelia was a native of Bath, and Mary Austin, now 25, is listed as “sister in law” which means she was Cornelia’s sister so the books are co-authored by the sisters; Mary, as eldest unmarried sister, being addressed as “Miss” on the book’s title cover. Charles was still a “Berlin Wool Dealer”. The household have three servants. In 1871, Cornelia was visiting a family called the Fishers, in Liverpool and Charles and their family can be found at Brook St, in the parish of St George Hanover Square, London. Mary Austin still lives with them, and is listed as “Berlin Wool worker”. The blue silk sock was made with YarnAddictAnni‘s Pure Silk Laceweight. And then a version of the sock, based on the original, using Sublime Lace Extra Fine Merino Wool, 25g, 100% wool in Colour 0397 (discontinued) – Ecru. I bought the Sublime on my way home from Haworth, the day I looked at the sock, whilst the precise shade of parchment/ecru of the sock, was still fresh in my mind; dropping in at the fabulous treasure trove that is Coldspring Mill. Any laceweight would do for these (highly impractical) socks. But I should point out the originals are neither silk, nor merino; but cotton. They photograph with a fair bit of lustre so look to be silk in the images but they handled and looked, in reality, like cotton. It looked to be millspun, but with no loose ends it was hard to tell. Anyone who wants to Comment below on the skewing that’s going on – I’d be grateful for your opinion. There were limitations to documenting the socks. They are sewn flat, into a book of priceless letters. So no turning inside out, and barely possible even to see the wrong side of the knitting. The socks were probably not knitted by Charlotte Bronte herself – Charlotte was 5 when her mother died so it is feasible she was the only one of the three surviving Bronte sisters, who may have been taught to knit by her Cornish mother. But the socks came to The Bronte Society via a donation – the Seton-Gordon Collection, donated by Elizabeth Smith’s grand-daughter. Elizabeth Smith was born in Regency times – before published knitting patterns. So it’s likely this was a sock formula she had in her head. I looked at commercial patterns of the 1840s and slightly later as well, to get an insight into the heel and toe treatments but what we’re looking at here is, essentially, a Regency sock! You can read more about the Smiths, here. Cornelia Mee and Miss Austin’s baby socks, had a slightly smaller number of cast on stitches: 53, as opposed to the 60 or 62 on Charlotte’s baby sock. Misses Austin and Mee recommended the knitter use “the finest Shetland wool” or “No.30 Knitting Cotton” and size 17 (1.5mm) needles. To put that in perspective, most modern knitting needle conversion charts only go down to size 14 – 2mm – needles. In fact, I couldn’t have knitted these sans tishie, somehow – it made the whole process of knitting laceweight on 1.5mm needles not quite unbearable. (You don’t want to hear what I was saying when I did the 3 needle cast off, put it that way). I decided to work a Dutch Heel and a Flat Toe. I’m not positive these are the treatments used in the original, but they are close. In fact, the original sock’s toe has something unaccountable going on, if you look closely, with some crazy and weird decreasing. There are a number of recipes for what we’d now call babies’ bootees, in the Victorian knitting manuals – but comparatively few straightforward socks, like these. NB: The originals had a much more rapid (every round?) decrease for the foot, after the instep and heel flap stitches were joined back in the round, than my Ecru version has. There is also a bit more shaping on the legs of the originals (Possibly one or two more shaping rounds than I did). These are most definitely not an accurate reverse engineered version, just an approximation for fun. So, with no further ado, here’s the pattern for the white socks. (Not tech edited, so proceed with due caution). I just wanted to have a go to see if I could. Neither sock will be getting a companion, any time soon. Blue sock is Cornelia Mee and Mary Austin’s pattern; ecru sock is my off-piste version of the original sock! Divide the sts so you have 27 sts for instep on waste yarn, and 29 sts still live, on which you’ll make a heel. Continue to Purl the purl centre stitch (now centre of heel). Cont to work heel on these remaining 29 sts (centred on P seam st). Or conversely, simply work in stocking stitch. Rep these two rows – or work in stocking st – til you have made roughly 20 rows, ending with a P row. Rep rows 3 and 4 one more time. Rep from * til all heel sts are incorporated onto one needle, end with WS row. Needle 3: PU 20 sts along other side of heel flap, and then work the first half of the heel stitches only from Needle 1. Which means your round now begins at CENTRE heel. Rep these 2 rounds til you have your original 56 sts. Then, work 12 rounds on these 56 sts. I worked a Flat Toe. Make sure half your sts are on instep needle (28 sts on Needle 2) and the other half are split evenly between two other needles (Needle 1 and Needle 2). (14 sts on each needle). Rep from * until 16 sts remain. I finish with a 3 needle cast off, on the right side of the work. With many thanks to Sarah Laycock at the Bronte Parsonage Museum, Haworth and the Bronte Society. First Series Of The Knitter’s Companion, Cornelia Mee and Miss Austin, London (date unknown, but sock appears in various Cornelia Mee books, and probably prior to 1855). Genealogy, today. And also, something in the spirit of the blog, where I like to talk about social and domestic history – especially women and children’s lives. I have always been fascinated by paracosms. In their most developed forms, they’re imaginary worlds like the Brontes’ Angria and Gondal, or Hartley Coleridge’s Ejuxria. For many children, though, they were maybe playing with toy soldiers, or dolls’ houses and that whole life of the imagination. A while ago I stumbled on a homemade 1940s’ dolls’ house. It had been found dumped in the street, outside a charity shop. It came complete with 1940s’ wallpaper, textiles (hand-stitched silk curtains) and a full compliment of handmade 1940s’ dolls’ house furniture, with a few commercially available items like some of the Britain’s Miniature Garden items, thrown in. Intriguingly, it came with a file of documentation. The file contained wartime letters from a little girl to her father (on active duty). Many letters concerned her dolls’ house and what she was making for it. Over time, I will share with you, gentle Reader, little Brenda’s story and show you inside the dolls’ house and its items. And, when I’m done, the dolls’ house itself. Not pretty – but made with love. The letters were carefully filed in date order and are a poignant look into the everyday world of a child in wartime. The dolls’ house seems to have been emblematic of the bond she felt with her father. On the outside of the house, Brenda had written, in pencil, “Roedean”, which when I was told about the house, before I saw it, at first I assumed must be a reference to Brenda’s school. It turned out, it was the name of her beloved home, and the dolls’ house was her Roedean in miniature. With no further ado, I will start the story. Not Brenda’s. From my own collection. 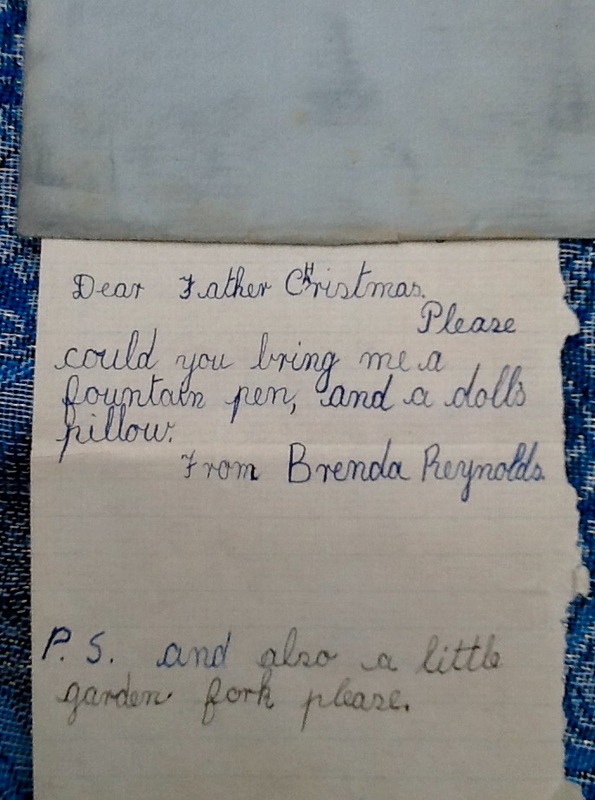 I may blog other stuff inbetween, but over some time, will weave in and out of the other stuff, the lovely, touching story of Brenda Reynolds. Most of her letters are addressed to her dad. But the first is to Father Christmas. The dated letters start in 1942. This could be that year, or earlier. I traced Brenda and she is no longer alive. She was unmarried and had no direct descendants I could find. Maybe the dolls’ house and letters were found in an attic before they were left on the street? Once I have shared this with you, I intend to re-home the dolls’ house with either a collector who will know how to preserve it – or a museum. I think it deserves a wider audience first, though. I managed to trace Brenda on Ancestry and FindMyPast. 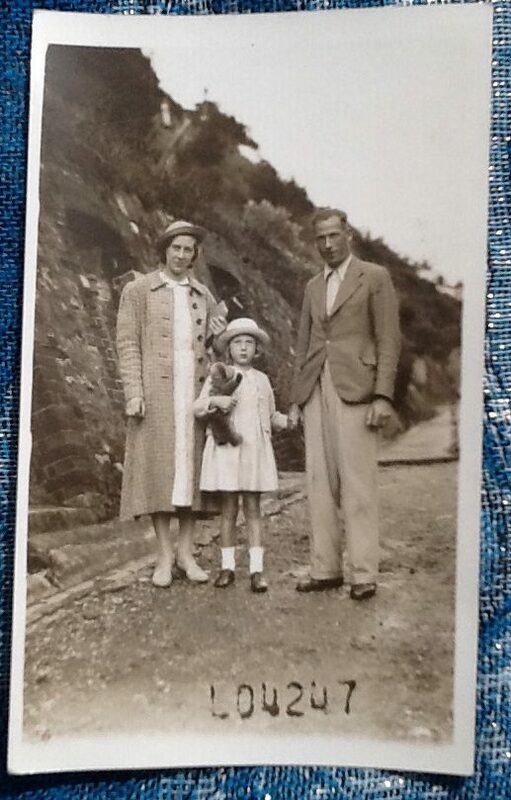 FindMyPast has the 1939 Register – a snapshot of the UK on the brink of War, and I was able to use this to locate Brenda and her loved ones. The letters had her address on, which helped. Someone slipped into the dolls’ house file, a few photos of the family of three. It seems Brenda was an only child. In wartime, toys were scarce so there were probably more dad-made dolls’ houses than usual. Until the War, Lines Brothers (trading as ‘Triang’) had probably been the best known dolls’ house makers, but the Triang factory went over to munitions, so as the dolls’ house was made after 1939, it would be very typical of a wartime dolls’ house. As I put up the letters, I will put up the items that Brenda mentions. 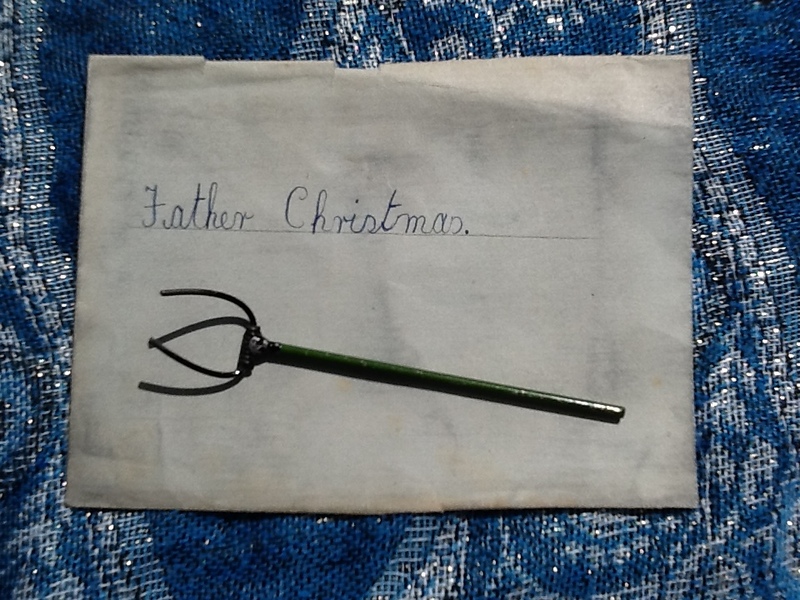 The first, (above) is a Britain’s garden fork. Pre-War these toys were made of lead. During the War, they weren’t manufactured and returned in plastic, re-named Britain’s Floral Garden, in the 1960s. 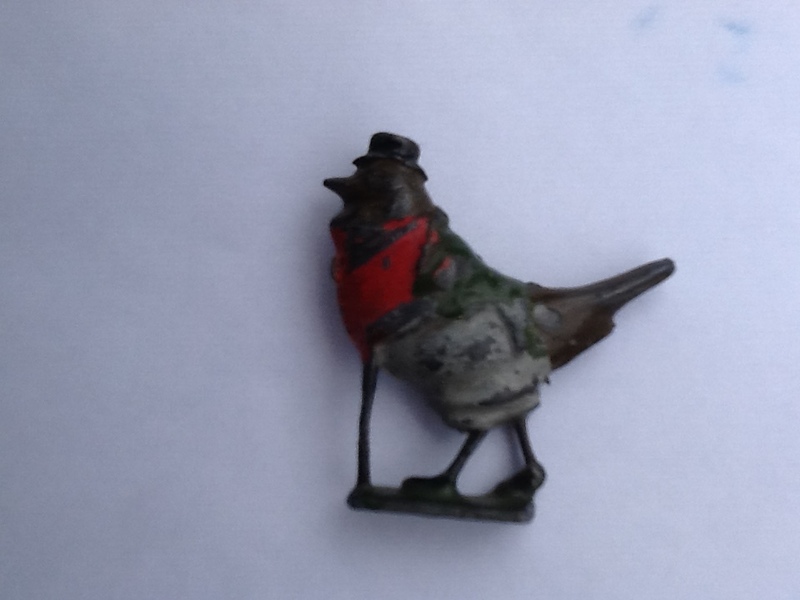 It’ s quite startling to read of an item in the letters, then find it in the shoe-box where they currently reside. Billie (left) presumably when he was officially old enough to join up. His brother Norris – a year older than him, who was to die at Passchendaele, on th eright. I have an almost-16 year old son. I can’t imagine him being at the First Day of the Somme. Yet my great grandmother was in that situation, on the 1st July, 1916. 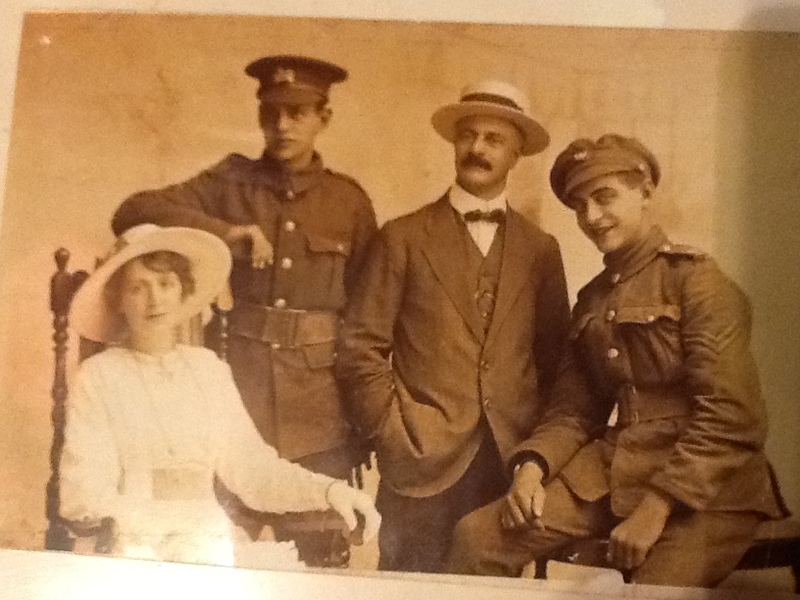 In fact, it’s likely both her sons were there – her eldest, barely 18, was in The King’s Own Yorkshire Light Infantry. My grandad, Billie, was only 15 when he ran away to join the Army. His first action was the first day of the Somme. He was a bugle boy, in the West Yorkshires Regiment. I can’t imagine a 15 year old child walking into the bloodiest battle in history – over 30,000 soldiers died that day. He was there. He came out alive. His brother was to die at Passchendaele, the following year. Not long after, he was brought home but re-enlisted the first chance he got. When he returned home to Leeds, he was the only young man of his age for streets around, according to a younger brother. My grandfather went on to live – and fight – through two World Wars. After the War, he was a sargeant in the TA so called up on the first day of WWII. My favourite WW1 poem is by fellow Leeds lad, Isaac Rosenberg. Another one who didn’t make it out alive.